You can use regular pancake mix for this recipe but you’ll miss out on that amazing blue corn crunch. If you do, you’ll need about 2 cups of batter for the recipe. In a bowl, mix together the pancake mix with the chipotle chile, egg and milk. Fold in the zucchini, corn and cilantro or parsley. Heat a skillet or frying pan and add a tablespoon of the oil. Pour about ¼ cup batter onto the skillet for each pancake. When the surface of the pancake begins to bubble slightly, flip and finish cooking. Keep the pancakes warm. Add more oil as needed and cook the remaining cakes. 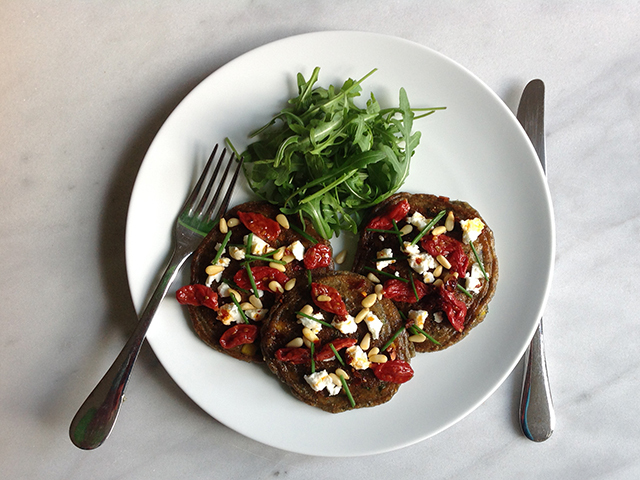 Serve hot, topped with the goat’s cheese, sun blushed tomatoes and pine nuts.